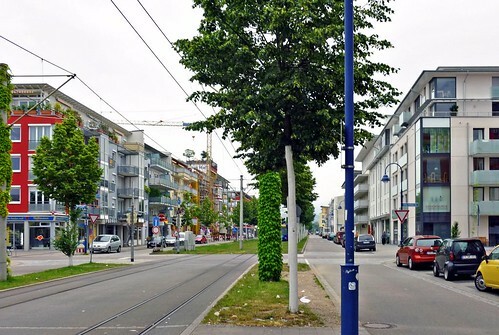 This post from Kaid Benfield’s Blog on Switchboard drives to the heart of the problems we seem to experience with the (fairly) widespread adoption of TOD, Smart Growth and New Urbanism principles – even here in South Africa, Planners, Architects and Engineers have embraced these ideas and a lot of emphasis is being given to improved transportation such as high speed rail (Gautrain) and BRT projects that were coupled with the Soccer World Cup 2010. What is less obvious is the need to couple this with decentralized water and sanitation systems and reduced car use – overall a decoupling from consumption driven growth – here most people – even those who don’t have them, can’t seem to give up the idea of having a free standing house on its own piece of ground, two or more cars in the drive and using them to go to the mall, even if its round the corner. If you watch the media and TV you can clearly see why: that s what’s being shown in the soaps, driven by the ads and spawned by commercial interests and politicians who need compounded GDP growth art all costs to win elections and let’s face it most of us whohave these things are not rushing to give them up – we ‘of course’ have the excuse here that the transport systems don’t work, crime is rife and there is no other option but to hop in out car every time we think of anything we need! I’ve been a bit of a one-man band over the last 2-3 years, arguing that we need a second generation of smart growth theory that goes beyond thinking about land use patterns per se. We now know from tons of research that smart land use patterns – neighborhoods that are compact, well-located, walkable and transit-served – are critical to a sustainable future. They conserve land and reduce driving, reducing carbon and other emissions from transportation. But there are so many important elements of sustainability that land use patterns themselves do not reach or at least do not satisfy, from water consumption and runoff to building and infrastructure energy, to equity and more. Yet, from where I sit, it seems that many of my fellow smart growth advocates remain stuck in a 20th-century model of smart growth, focused almost exclusively on land use and transportation. This is partly because of what was perceived as a special opportunity in anticipation of new omnibus federal transportation legislation that was due to be enacted two years ago (but hasn’t been). Progressive philanthropy moved significant resources into transportation, and their grantees followed. This includes NRDC, of course, and I would be the last to argue that sustainable transportation does not remain paramount to a more sustainable America. I’m glad we’re in the game. But it’s not enough, and that is why I am so pleased to see one of the country’s leading transportation researchers and thinkers – UC-Berkeley’s Robert Cervero – along with Cathleen Sullivan from the transportation consultancy Nelson/Nygaard Associates, call for a “greening” of transit-oriented development. With Michael Bernick, Cervero wrote one of the first comprehensive books on TOD in 1997, and has continued to publish on the subject since. People like me cite his research all the time. 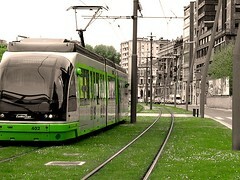 “A new ultra–environmentally friendly version of transit-oriented development—green TOD—is taking form in several global cities. Green TOD is a marriage of TOD and green urbanism—a combination that can yield environmental benefits beyond the sum of what either can offer individually. “TOD helps shrink a city’s environmental footprint by reducing vehicle-miles traveled (VMT)—a direct correlate of energy consumption and tailpipe emissions. VMT declines not only from the shift of trips from auto to transit, but also replacement of auto trips to off-site destinations with on-site walking and cycling enabled by mixed land uses. 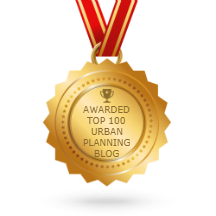 “Green urbanism reduces nontransportation energy use, emissions, water pollution, and waste production through green architecture and sustainable community design. 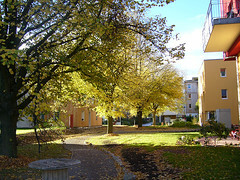 With green urbanism, pocket parks and community gardens replace asphalt parking. Renewable energy might come from solar and wind power, as well as biofuels created from organic waste and wastewater sludge. Insulation, triple-glazed windows, airtight construction, and use of low-impact building materials further shrink the environmental footprint of green TOD. 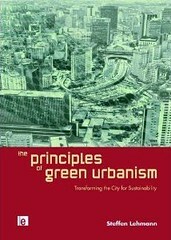 Among the possibilities, say the authors, are using wastewater or combustible waste to produce energy, using space saved from reduced parking demand near transit for gardens and other green infrastructure, and taking advantage of rooftops on transit stations to place solar panels. 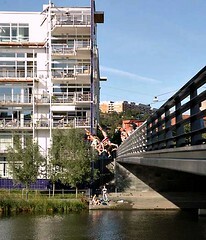 “Hammarby Sjöstad’s green urbanism is found in energy production, waste and water management, and building design . . . [C]onservation measures include extra heat insulation, on-demand ventilation, individual metering of heating and hot water use in apartments, lighting control, use of solar panels and fuel cells, reduced water flow, and low-flush toilets. 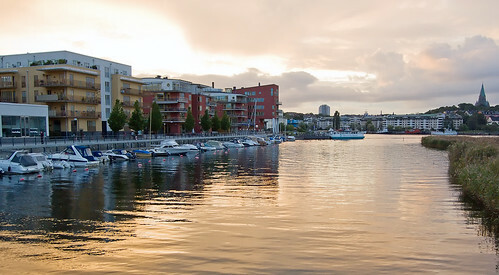 the authors write that the project has achieved a 39 percent reduction in air and water pollution and a 42 percent cut in nonrenewable energy use compared with communities in Greater Stockholm with similar household incomes. Of course, even these great improvements don’t explicitly reach such important sustainability issues as equity and public health. But they are a start, getting us out of the trap of expending so much brainpower on the transportation side of sustainability that we begin to think that more efficient transportation is the only environmental objective that matters when we encourage “smart growth” or “sustainable communities.” The fact that these additional concepts are being endorsed by researchers so respected in the transportation field will only help them gain currency, which they richly deserve.